The words “elegant” and “disposable plastic tableware” never really went together until I discovered the premier online retailer Smarty Had A Party which has a fantastic selection of elegant disposable tableware. These Classicware white plates 10.25” are lovely and would be perfect for Thanksgiving and holiday gatherings. In the past I have always pulled out my formal china dinnerware because I wanted my holiday tables to look really elegant and forma but what I didn’t like was all of the work that goes along with it. 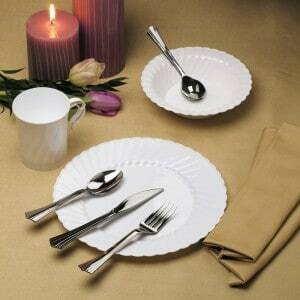 The Scalloped Ivory Plates from Smarty Had A Party are the perfect alternative. I can serve my guests on plates that really look like china but are durable disposable plastic plates. I am getting excited just thinking about how easy it will be to clean up after my holiday dinners and parties this year. Instead I will be able to spend time with my family instead of washing, drying and putting away dishes. I also won’t have to worry about my children breaking my heirloom china and that is a big relief. Thankfully, I won’t be compromising style by using disposables. In addition, I can coordinate matching Classicware bowls, 7.5” plates, coffee mugs and even silverware too. I was very impressed with theFlatware-Silver Replica. The quality was top notch and durable and if you didn’t look very closely you wouldn’t even realize it was plastic. The coordinating Classicware white 8 ounce coffee mugs are perfect for serving coffee and hot chocolate. The mugs are lightweight and rigid. Smarty Had A Party has a fantastic selection of dinner plates to suit every occasion and taste and you can view her to find your personal favorite. The prices at Smarty Had A Party are very affordable too. The Classicware white plates 10.25” are only $11.49 for a package of 18 plates. The Classicware white 8 ounce coffee mugsare only $3.39 for a 8 mugs. Flatware-Silver Replica starts at only $3.75 for a package of 40. Smarty Had A Party has everything you could possibly need to plan your next special event, party or holiday dinner from table centerpieces, candle holders, party fountains and of course the most elegant disposable dinnerware. They offer free ground shipping on all orders over $275.00.